What Are the Top-Ranked Search Keywords for Your Blog? Just going through the blog stats after a week off. I noticed my blog post about Facebook’s new newsfeed getting a lot of hits via search. 1. “Farewell email“: My blog post How to Write a Farewell Email to Your Co-Workers usually ranks in the top 5, and often is #1. 2. “Pay By Touch“: Two blog posts make it into the top 5 results: Pay By Touch & the Peanut Butter Manifesto, Farewell, Pay By Touch, Farewell. 3. “Facebook slow“: The post Facebook’s New Newsfeed: Slow. Over-engineered. I Like It. has climbed to #5 in the search results for this term. 4. “Should I buy an iPhone“: Shockingly, Should I Buy the Apple 3G iPhone of the Nokia N95? comes in at #7 in response to that search term. 5. “Blog aggregators“: Coming in at #4 for that search term is Explosion of the Blog Aggregators…How to Keep Up. That’s not a complete list, I’m sure. But some that I’m currently seeing in terms of traffic. There’s something of a disconnect, as you’ll notice lots of FriendFeed, Twitter, blog and social media posts. Those posts don’t receive quite the same search engine positioning. But they are very popular topics written about by many others. Me? I’ve just happened to land a few hits for less popular blogging topics. And the iPhone search engine ranking probably resulted from a fortuitous link from MacSurfer.com, which gave it good link juice. How about your blog? What are your blog’s top search terms? The day-in, day-out work of employees is tough on innovation. You have to get done what your managers, and the company needs today. Now there’s nothing intrinsically wrong with getting the near0term stuff done. Companies would be chaos if everyone did their own thing. But the typical work day is not conducive to maximizing innovations. Which is where employee blogs come in. Enterprise 2.0, if you will. Several things limit the amount of innovation coming out of larger companies. General Busyness. Andrew McAfee has a nice post on this one. We’re all very busy. It feels that way, doesn’t it? And it’s not just any busyness. Your hours must have an immediate, measurable outcome. That leaves little time for the longer term, R&D-oriented type of thinking that can result in breakthrough ideas. Google’s 20% of time for personal interests stands out as an example of a company fighting this dynamic. Existing Processes Are Hard to Change. The current products, internal practices, meetings, sales efforts, etc. are all geared to what is going on today. Much of this infrastructure is decreed from the top. New ideas which require these same corporate resources get a tough reception. It’s like you’re adding new work to everyone’s day. Proximity Drives Relationships. We tend to share our thoughts with those we work with regularly. It’s natural. These form our relationships. So if you have a new idea, you’ll naturally bounce off these folks. But it’s crap shoot as whether you’ll get far this way. Your colleagues may not be interested or are too busy. A good idea can suffer a premature death. Ideas Go to the Email Inbox to Die. Email is a tough medium for idea exchange. You can send your idea to someone else. If the recipient doesn’t have an immediate response, the email just sits there. And sits there. And sits there. Before long, your email is six feet under. Never to be read again. Email also suffers from limited distribution, unless you spam the corporation with your idea. Now it’s not like innovation is failing to occur. But do companies’ internal pendulums swing so far toward busyness that they’re not maximizing their vital innovations? You ever have an idea that you really thought had legs? Well, if you just keep it to yourself, it won’t go far. Your butterfly wing flap needs to be picked up by others. The process of talking out your idea is important for validating it, refining it, seeing if it has potential. These conversations are hard to have based on the usual workplace dynamics described above. Sure, some will happen. In a company of 10,000 people working 40 hours a week, 50 weeks a year, there are 20 million hours annually. Out of these 20 million hours, some innovation conversations will happen. But enough? New ideas also challenge the status quo. They need time to sink in. Colleagues know the existing processes, products and services well. How does your idea affect that? How will it improve it? It’s hard to rush people to grok your idea. This gestation also lets the idea play out more fully. It can be refined, altered, researched. Others pick up the idea and discuss it. It gets socialized. Others can become advocates, including those with a say on corporate resources. As a result of these conversations and gestation time, some ideas will emerge as real opportunities. Many won’t. In fact, most probably won’t. But that’s OK. Real innovation is hard to achieve; if it wasn’t, we’d all be enjoying our start-up IPOs, right? This pruning is healthy and necessary. 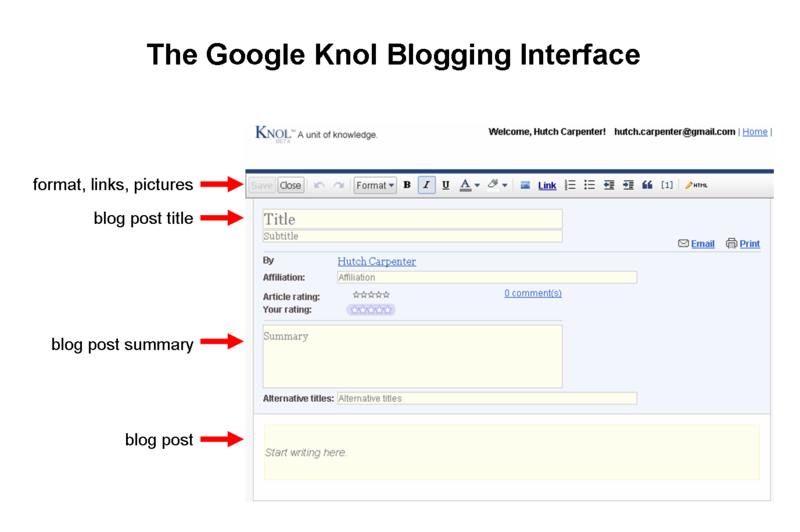 In my brief blogging experience, my eyes have opened to the power of blogging. You put an idea out there, and see what others think. You make connections. You read other blogs for different perspectives. General busyness: Blog posts need not take a lot of time. Ideas can be entered in 10 minutes. Existing processes are hard to change: A blogged idea does not put someone in the awkward position of considering how it will increase their workload and change their routine. Proximity drives relationships: Blogs are location neutral. Anyone can find them. Forget the guy in the cubicle next to you. The employee in Asia might grok your idea. Ideas go to the email inbox to die: Blog posts live on. They’re RSS-able. They’re shareable. They’re searchable. They’re taggable. And they can be accessed by everyone. Blogs let the conversation continue in an asynchronous fashion. You can comment on a post. Share it with a colleague. Link to it. You can build on someone else’s post. Recruit others to your cause. All of these factors contribute to the gestation period needed for the new idea to take hold. And they help prune ideas so the ones with the most potential survive. An interesting thing occurs from this: new employee social networks emerge as connections among bloggers. There are the people you work close to. Those whom you collaborate on projects. And now new connections are made based on knowledge and innovation. Those last ones may be the strongest of all. Employees can also raise their profile and reputation with their blogging. Here’s a nice example. EMC is deploying web 2.0 technologies inside the enterprise, an effort that is being blogged by Chuck Hollis, EMC VP Technology Alliances. In a recent post, he describes how several internal employee bloggers are “graduating” to be external bloggers. That’s right – they now will engage the market on behalf of EMC. All in all, blogging holds tremendous benefit for companies. While many employees won’t do it, those that do can become real drivers of innovation. 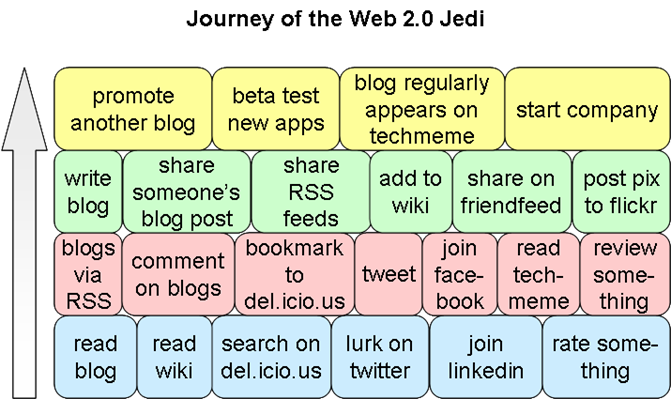 Thinking about the ever deeper levels of involvement one can have with Web 2.0 apps and the Web 2.0 ethos. Came up with this chart.